At Craven Cottage last Saturday for the visit of Harry Redknapp’s relegation-threatened Portsmouth. These days, just about every football ground has some kind of memorial to its glorious dead, from the Munich plaque at Old Trafford to the Shankly Gates and Billy Bremner’s statue. Is it just me, or is football carrying just a bit too much heritage right now? Fulham are gearing up to join in with some kind of tribute to Johnny Haynes, and they were inviting all-comers to sign a colossal white shirt in his honour. 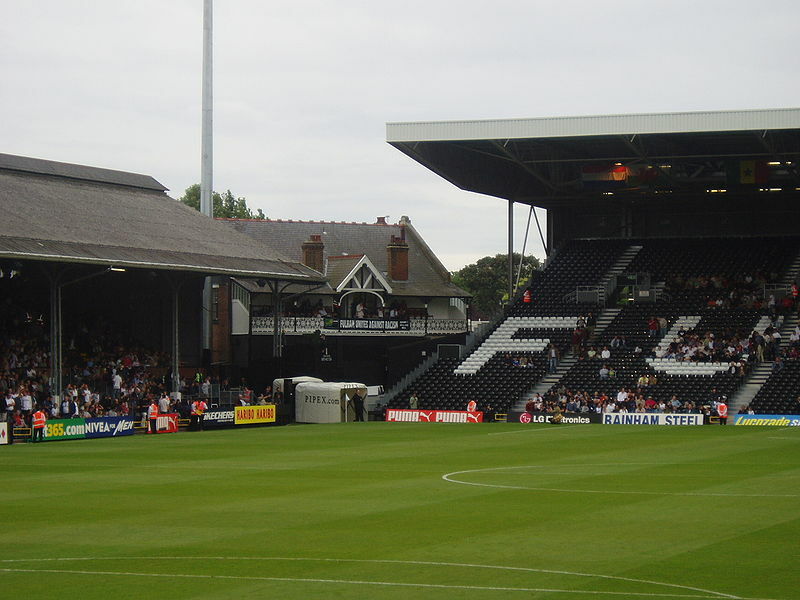 In Haynes’ era, Fulham was still a firmly working-class area, and there were hints that this was no longer so – PA announcements of fans’ birthdays etc. always referred to people coming from what sounded like a widespread home counties diaspora, Gerrards Cross, Carshalton, Haynes, Croydon. Former players, announced at half time as presenters of raffle prizes and the like, were carefully put into context – it wasn’t assumed that you just knew who they were. The ground has a definite “heritage” air to it – obviously from the Cottage itself, but also from the Edwardian turnstiles that your overweight writer could scarcely fit through, and from the Stevenage Road stand of similar vintage. But the place as a whole was spacious, friendly and well-run – a real pleasure just to wander around before taking to your bucket seat for the game itself. Fulham’s fans were outshouted by the visitors, and their team was comprehensively outplayed. Apart from his first-minute error to concede the opening goal, Wayne Bridge was far and away the best player in a white shirt, used as playmaker as well as defender and wide midfield. His touch and control, and his positioning, were all of the highest class, and I imagine he was well aware of Sven’s presence in the Riverside Stand. Steed Malbranque took an interest in the game, and Zat Knight improved as the afternoon went on, but otherwise Fulham were shockingly poor. Out of ideas, out of energy, short on skill – especially the latter. My third and final favourable Fulham mention goes deservedly to reserve keeper Tony Warner, whose professional warmup put his listless ball-punting colleagues to shame. He didn’t make it onto the pitch otherwise, but he gets my Fulham man of the match award. Best for Portsmouth was, I suppose, Lomana LuaLua, but the touch, skill and courage were outweighed for me by his constant niggling gamesmanship and “attitude”. So I’m going for Sean Davis, the former Fulham man, booed every time he went near the ball, decried as “Judas” (Judas? Pat Reid, more like.) but always quick and careful with his possession.